Kennedy button plus reception invite of Jean Kennedy Smith. This would have been a fund raiser for Robert F. Kennedy 19 days before his assassination. There are 2 items in this listing. 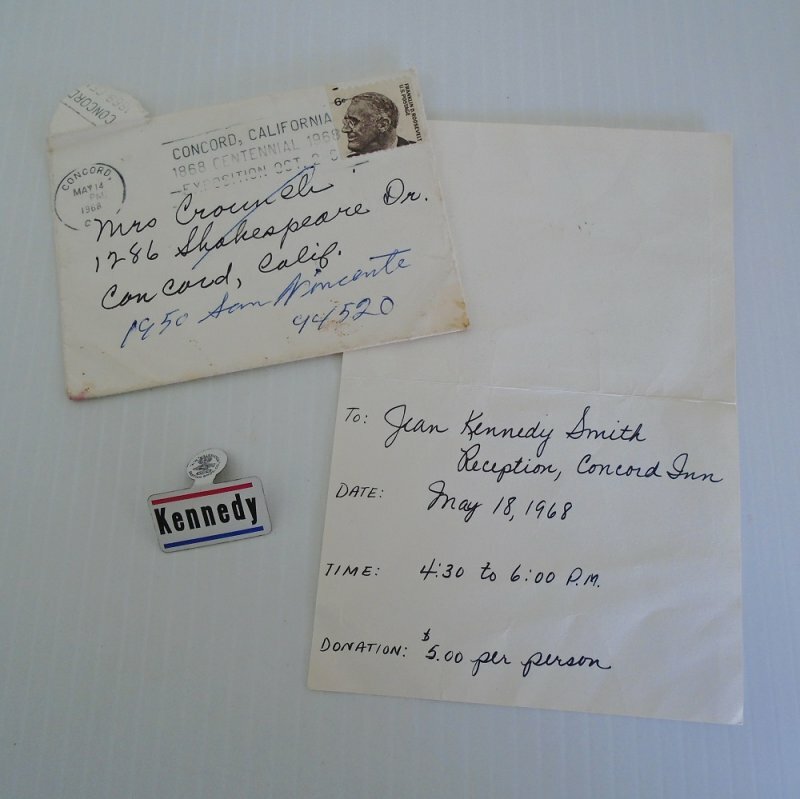 One is a hand written invitation to a reception at the Concord Inn, Concord California on May 18, 1968, and the other item is a Kennedy tab over pin button. The invitation is its original hand addressed envelope and both items were sent together to a Mrs. Crounch in Concord California. The significance of this event is that it would have been a fund raiser for Robert F. 'Bobby" Kennedy as the reception was just 19 days before he was assassinated. Delivery will be via USPS First Class Mail from California. Buyer to pay delivery charges of $1.50. To avoid duplicate shipping charges, please contact seller for combined shipping charges if multiple purchases are desired. Jean Kennedy Smith Robert F.